“How about we split half a cat?” he asked me with all seriousness. That question was made in reference to an eatery which has garnered a notorious reputation among our circle. I’ve never visited the establishment due to the reports I’ve received from my colleagues. Yet it amazes me that they keep returning to it. “Half a cat?” I asked. “Seriously.” He couldn’t maintain his poker face much longer though. Also what is it with people walking their dogs in the park without a leash…when there are signs clearly posted that pets must be leashed at all times?? Granted most of the time the dogs are well-behaved. Imagine though being a parent with a tottering toddler only to be confronted with a too boisterous oversized German Shepherd…or St. Bernard…or some frisky animal that is five times the size of your child. I shudder. Speaking of German Shepherds, I saw the most bizarre dog a few months ago. This dog had the body of a Bassett hound but the head of a German Shepherd. Remember dying Easter eggs when you were young…er? I remember going to my friend’s house and dying eggs. We had an assortment of colored water in which to dip our hard-boiled eggs. In addition we had stickers, colored markers, Easter baskets in which to put our beautified eggs and bags of plastic grass. We spent the afternoon dying eggs until our fingers were grayish black due to all the colors mingling on our skin. A waste of eggs. By the time the Easter hunt arrived we were much more interested in the plastic eggs containing candy. I have not decorated Easter eggs since then. No inclination or desire to…until…. Williams Sonoma displayed in their store an Easter egg decorating kit. All of a sudden a plethora of childhood memories flood me. Jelly beans of every color, white & cotton candy pink Sunday dresses, chocolate bunnies, and Easter egg hunts on the church lawn. All of a sudden I felt inspired to decorate eggs, but at the same time I wasn’t quite drawn to mixing bowls of colored water. Alas, Martha Stewart came to the rescue. 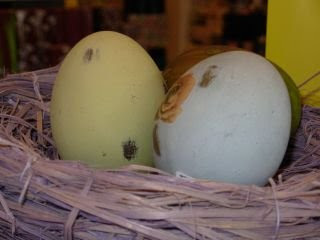 Her April issue of Martha Stewart Living featured ideas and how-to’s on decorating Easter eggs…decoupage style.